We’d love your help. Let us know what’s wrong with this preview of The Future of Capitalism by Paul Collier. Deep new rifts are tearing apart the fabric of Britain and other Western societies: thriving cities versus the provinces, the highly skilled elite versus the less educated, wealthy versus developing countries. As these divides deepen, we have lost the sense of ethical obligation to others that was crucial to the rise of post-war social democracy. So far these rifts have be Deep new rifts are tearing apart the fabric of Britain and other Western societies: thriving cities versus the provinces, the highly skilled elite versus the less educated, wealthy versus developing countries. As these divides deepen, we have lost the sense of ethical obligation to others that was crucial to the rise of post-war social democracy. So far these rifts have been answered only by the revivalist ideologies of populism and socialism, leading to the seismic upheavals of Trump, Brexit and the return of the far right in Germany. We have heard many critiques of capitalism but no one has laid out a realistic way to fix it, until now. To ask other readers questions about The Future of Capitalism, please sign up. Looks like an interesting book to read. Shows which countries in the world that are prospering and the ones that are in economic decline? I found this to be a pretty terrible book. It has the kernel of some good -- or at least interesting -- ideas but it does such a poor job of putting forward arguments in favor of its suggestions that I end up feeling like I wasted my time reading this. It doesn't help that few of his suggestions seem practical and the few times he addresses practicality he throws up his hands. It also veers off into tangents that seem totally unrelated to "The Future of Capitalism". When you discover that the gen I found this to be a pretty terrible book. It has the kernel of some good -- or at least interesting -- ideas but it does such a poor job of putting forward arguments in favor of its suggestions that I end up feeling like I wasted my time reading this. It doesn't help that few of his suggestions seem practical and the few times he addresses practicality he throws up his hands. It also veers off into tangents that seem totally unrelated to "The Future of Capitalism". When you discover that the genesis of the book was an essay on the 'state of society' (and not capitalism) per se, these tangents make a bit more sense. But writing a book about the "the future of society" seems so absurdly over-broad (which society? US society? UK society? European societies? All societies in the world?) that any attempt is bound to be unsatisfying. It is also a tale of two books, where the first half and the second half feel like totally different books that were glued together. In the first half, Collier puts forward the intriguing thesis that the fundamental problem in capitalism/society today is the destruction of "community". His strawman argument (and he abuses strawmen, more of this later) is that the left destroyed community in favor of The State and the right destroyed community in favor of hyper-individualism. And this shift by both of ends of the political spectrum has wreaked havok with the traditional notion that rights come with responsibilities. Now everyone (for different reasons) has rights with no responsibilities. And so the first half of his book is an attempt to restore "ethics" via a rebirth of community and shared identity. It is an interesting idea but the primary flaw of the book soon becomes apparent: Collier never really grapples with the hard problems of any of his suggestions. How do we build a "shared identity" in the modern world? He acknowledges that nationalism has an ugly history, so that's not the way forward. But what is? He makes the claim -- hard to believe -- that "in many societies, traditional national identity was genuinely inclusive of everyone in the society". Many people will see a claim like that and wonder if the author is completely detached from the reality of late 20th century. Indians in London in 1960 felt "genuinely included"? Gays in 1950 Manchester felt "genuinely included"? Blacks in 1960 Birmingham felt genuinely included? Latinos in 1960 California farms felt "genuinely included"? It is hard to square this obvious reality with Collier's position. And because he doesn't seem to understand this diversity and the reasons for the many strains of anger over the past ~50 years among these kinds of groups, his calls for a shared identity come without any workable approach. How do we build a shared identity in the modern world without re-creating a monoculture? Ultimately Collier calls for patriotism, not nationalism; "In contrast to nationalism, patriotism is not aggressive." But how does someone actually create patriotism, especially in places like Sudan or Papua New Guinea. Collier makes it sound like a trivial task but, for instance, Francis Fukuyama recent two-volume set on "The Origins of Political Order" and "Political Order and Political Decay" is 1,300 pages showing how hard -- borderline impossible -- this task is. Ironically, during the entire book -- despite his focus on shared identity -- Collier never refers to himself as British or a UK citizen. Instead he constantly thinks of himself as a Yorkshireman (despite not having lived there in decades). So it feels like even a product of the golden 1950s-1970s failed to be instilled with a sense of true nationalism and instead kept the tribalism of his childhood. 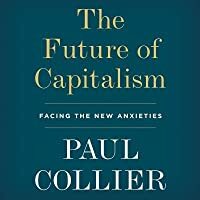 In the second half of the book, Collier embarks on a scattershot of policy suggestions, many of which seem unrelated to "the future of capitalism". He holds a personal animus for the system of foster care & adoptions, simply because he personally experienced it. I dare anyone to show a relationship between that and "the future of capitalism". Likewise, there's a long section on how to provide better support for teen parents. He talks about the problems of de-facto social, cultural, and racial segregation in schools due to the fact that schools get their students from a certain geographic area and nowadays we see increased self-sorting. (A theme that Tyler Cowen talks about in more depth in his book The Great Stagnation.) He suggests the solution is to change the catchment area of school -- base them on purpose (perhaps a school for arts, a school for engineers, etc) rather than geography. Then he admits he tried this in his own home town of Oxford and it failed miserably due to popular backlash. He lamely concludes, "They succeeded in blocking us; perhaps you might have better luck." In another instance he talks about the failings of modern retirement systems -- at least in the US & UK -- and all he has to say is "As with minimum wage laws, French policy looks to be superior to the Anglo-Saxon model: the high contributions required by employers ensure that as long as people work they build up an adequate entitlement to a pension". This is emblematic of many of Collier's arguments. First, what is "the French model". Does anyone reading that passage actually understand what the concrete policy proposal is? Secondly, there is a lot of research on pension systems around the world. If we look at one such source of actual research, the Melbourne Mercer Global Pension Index, France hardly looks like a good model. France receives a "C" grade -- the same as the US. Why is Collier recommending the French model and not, say, the Danish model (#1 in the world according to the Mercer index) or the Dutch model (#2) or the Australian model (#3, plus an "Anglo-Saxon" country). The weakness of Collier's policy recommendations is the fundamental flaw of the book. But the most annoying part of the book is his constant reliance on absurd strawmen. And the end of the day, virtually every single one of Collier's proposals ends up being extremely left-wing/socialist. For instance, he suggests that property owners be FORCED to sell property at below-market prices to renters. He recommends forcing companies to limit working hours ("long work hours can be discouraged by taxation") & increasing the amount of vacation. He wants to tax financial transactions. He wants to tax private litigation (to reduce the number of court cases). Eventually, Collier realises this and even has an entire section defending against this and writes "What I advocate is not a variant of Marxism". When you have to write "I am not a Marxist" you are probably not advocating centrist, "common sense", "practical" suggestions. * they are "discrediting family obligations in favor of equal obligations to all children [around the world]". Didn't you know that every single Democrat thinks we should abandon obligations to our children? * "Those on the left want to return to the rent controls of the 1940s". Didn't you know that every single Democrat is in favor of rent control? * "Ironically, the left wants nationalized industries". Didn't you know that every Democrat wants tons of nationalised industries?! * "The currently fashionable alternative is public ownership." Can you name a single industry that you've seen a mainstream article about nationalising? * "Instead, applying Unitarian principles, they make no distinction between their less educated follow citizens and foreigners." Really? No distinction? And so on. It isn't just The Left who comes in for this strawmanning. Politicians also get a lot of it. "Yet, for decades, mainstream politicians have consciously avoided narratives of belonging. Indeed, they have actively denigrated them." It is a shame that the rhetoric is so poor because I think that Collier does have some genuinely good ideas and some genuinely interesting suggestions -- even if I don't agree with them all, I think they are worth discussing and thinking about. If Collier threw away 80% of the book and revisited the parts about rebuilding communities & shared identity -- but did a less superficial take on the plethora of identities in the modern world and the challenges that has for building a shared identity -- I think this could have been a really interesting book. This is a wonderful book, even better than I expected. The author is a respected and well published Oxford economist. The intent of the book is to provide a thoughtful overview of the problems facing global capitalism and even offer some possible fixes, perhaps in conjunction with his retirement thoughts. The result is a complex and well done integration of economics, politics, history, philosophy, ethics, and culture that spans continents and crosses multiple levels of analysis with ease. All o This is a wonderful book, even better than I expected. The author is a respected and well published Oxford economist. The intent of the book is to provide a thoughtful overview of the problems facing global capitalism and even offer some possible fixes, perhaps in conjunction with his retirement thoughts. The result is a complex and well done integration of economics, politics, history, philosophy, ethics, and culture that spans continents and crosses multiple levels of analysis with ease. All of the issue areas one would expect are present and accounted for - Brexit, Globalization, China, Trump, tariffs, taxes, ideology, populism, and so on. So what is the punch line? READ THE BOOK. He does present a general argument that spans levels, perhaps too easily. His focus is on relational logics as bases for personal meaning rather than atomized individualism. This is joined with a story of how social order at all levels has been corrupted and weakened due to disruptions of governance at the level of the society, the firm, and the family - among other collectivities. One of the more striking arguments in the book for me concerned the growing prosperity of major huge metropolitan areas, coupled with the decline and decay of medium and smaller urban areas - think London versus the rest of the UK or New York and Chicago versus Detroit and Milwaukee. When he gets to fixing problems, the book seems a bit thinner, although it is still good for the genre, perhaps due to the author’s familiarity with development economics. He also makes a good case for pragmatism versus theoretical and ideological purity. Restoring the Inclusive Society - examining the class and global divides as well as the disparity between the "booming metropolis and broken cities"
Restoring Inclusive Politics - finding a way to operate politically without pervasive echo-chambers and the extreme distortions we find ourselves with which we are working. Collier is an Economics Professor at Oxford. He pointed out that the current problems of capitalism stem from assuming the existence of the unreal Economic Man and promotes Utilitarianism. As a result, profits are maximised, manufacturing and back end jobs are moved overseas, machines are substituted for human labour, the cities get richer, leaving behind the provinces. The educated pulls ahead from the uneducated. The elite starts to base their self esteem on their skills and not their national Collier is an Economics Professor at Oxford. He pointed out that the current problems of capitalism stem from assuming the existence of the unreal Economic Man and promotes Utilitarianism. As a result, profits are maximised, manufacturing and back end jobs are moved overseas, machines are substituted for human labour, the cities get richer, leaving behind the provinces. The educated pulls ahead from the uneducated. The elite starts to base their self esteem on their skills and not their nationality and look down on those left behind. Those left behind lose their jobs, hope and self esteem. They went to drugs, alcohol and even commit suicides. They strike back, voting out the establishment and choosing populists who promise to bring back the good old days. They choose to Leave and not Stay in big unions. Capitalism needs to realise that other than self interest, we need reciprocity and national identity. We take care of the disadvantaged and should change the system that is creating those disadvantaged in the first place. 1. State ethics. We used to have high taxes to redistribute wealth and services to the poor. That is gone because of globalisation’s tax rate race to the bottom. We need a national identity. However it cannot be based on values as that is very diverse. The only viable way is to have place identity. Leaders need to stop promoting a global identity and encourage patriotism again. Patriotism is not nationalism in the sense that the former promotes international cooperation not American First. Cities should be taxed (especially property tax) to restore the provinces. Form economic development departments, tax breaks and cheap land Nd court big companies to attract new businesses (like Singapore!). Immigration needs to be controlled because the less skilled are crowded out by immigrants who will work for far less, but the high skilled actually enjoy the increased productivity, but less willing to redistribute their income with higher taxes. We need more pragmatism, and choose more central leaders. That can be done by choosing the leader from the victorious political party and an informed electorate. We need to intensively support and mentor kids who are at risk. Zero sum game jobs need to be taxed much more. 2. Firm ethics. Firms have changed the mission statements from serving their customers to maximising shareholder value, cheered on by Nobel laureates such as Milton Friedman. This is repellent to most people. Every CEO and worker now works for himself and not the company. Investment is dropped and share buy back performed to ‘maximise shareholder value’. Mutually owned companies like John Lewis which enable share ownership and representation at the board for all employees are the way to go. Monopolies need to be broken up. If that is not possible, they need to be taxed. All companies should be required by law to consider public interest and board members prosecuted if that is not done. Companies need to be policed. 3. Family Ethics. Obligation to family has been change for that of self. The extended family is no more. Assortative mating keeps well educated families well educated, and the less so educated often times broken. We need to rebuild family obligations in the extended family again and not rely on the state. Encourage 2 parent families for the kids with state support. Help single poor women with support against addiction, mental health, housing and against violent men. Athens NGO Pause has been successful to reduce children who need to be taken care of by the state. Open up cafés near poor estates. Unemployment welfare helps prevents children neglect. Mix the children by wide catchment areas. Provide vocational training. Levy firms for training funds, have a minimum wage. Charge firms for lay-offs. Charge investment homes higher tax. 4. Ethical World. Rescuing other nations, enlightened self interest, help without expectation of return. Stop ‘beggar-thy-neighbour’ policies. Great clubs like NATO are hobbled by the lack of financial commitment by member countries (<2%). IMF degenerates into the rich countries telling rescued countries what to do, understandably to be avoided at all costs. A new group composing China, India, US, EU, Russia and Japan will be useful for collective action. Firms need to be encouraged to invest in poor countries. Overall, I’d recommend this as a necessary view from an economist on the deeper reasons why some Western first-world societies are experiencing shifts toward nativism and populism, and what is causing the widening gap between rich and poor. Collier does this by cogently explaining how excesses in both liberal and conservative thought have led us here. The corrective policy recommendations, though good in theory, are so far out of the political norms of the past three-plus decades as to feel hopel Overall, I’d recommend this as a necessary view from an economist on the deeper reasons why some Western first-world societies are experiencing shifts toward nativism and populism, and what is causing the widening gap between rich and poor. Collier does this by cogently explaining how excesses in both liberal and conservative thought have led us here. The corrective policy recommendations, though good in theory, are so far out of the political norms of the past three-plus decades as to feel hopelessly utopian even when Collier claims they will be difficult. In The Future of Capitalism, Paul Collier, a development economist most known for his work The Bottom Billion, tackles the rise of poverty and the "grim rifts" that have begun to define the politics of his own country, the United Kingdom. Economists who study developing countries have particularly interesting insights into how policies can work or not work at alleviating poverty and creating inclusive growth. Collier is interested in a new pragmatic politics that rejects both ideology and populi In The Future of Capitalism, Paul Collier, a development economist most known for his work The Bottom Billion, tackles the rise of poverty and the "grim rifts" that have begun to define the politics of his own country, the United Kingdom. Economists who study developing countries have particularly interesting insights into how policies can work or not work at alleviating poverty and creating inclusive growth. Collier is interested in a new pragmatic politics that rejects both ideology and populism, one which works to build a common narrative, shared identity, and sense of purpose to tackle the big structural problems industrialized countries face 30 years into globalization. The rise of the "psychopathic selfishness of economic man," he writes, has led to a deep fracturing in our sense of a common future, a common narrative, and a sense of obligation to our fellow countrymen. It has led to a fracturing of a common identity, and in that, skilled people have come to believe they know better than the less educated and are thus "entitled to override the values of others," eroding trust and cooperation. And cooperation is the basis for a well-functioning economy. Policy is spatial, Collier reminds us, and only by renewing a sense of belonging and togetherness can we begin to address the rifts tearing polarized polities apart. Too academic, dense and basically has nothing to do with its title or the subjects listed in the blurb. I was expecting a cogent analysis of the current state of capitalism and the way forward. What I got is an incoherent collection of essays on ethics, society, and nothing on capitalism in the first half of the book. Skip this one, and leave it to social science grad students. Solid 3.5. The ideas are very interesting; the preamble and diagnosis are well covered and the book spends a lot of time rehashing. This is an important book which outlines a format for capitalism that, if practiced, likely would relieve any number of conflicts and dysfunctions that worldwide societies and economies face. It's a longshot but a longshot worth debating and, with some fine tuning, implementing. Although the author, Paul Collier is a Nobel Laureate from Oxford University, this is not a scholarly work. It is, rather, the effort of a scholar tasked with global duties and advisory functions to her Majesty's governme This is an important book which outlines a format for capitalism that, if practiced, likely would relieve any number of conflicts and dysfunctions that worldwide societies and economies face. It's a longshot but a longshot worth debating and, with some fine tuning, implementing. Although the author, Paul Collier is a Nobel Laureate from Oxford University, this is not a scholarly work. It is, rather, the effort of a scholar tasked with global duties and advisory functions to her Majesty's government to meld his experiences and scholarly insights as an economist with his observations of the world in which he lives and works. He comes from place of the shared sense of community values, common good philosophy, and a view of the world shared by ordinary people who shared his early years and his roots in Sheffield and the devastation wrought upon families, workers, and communal solidarity as capitalism and the capitalist mandate failed the town he lived in before his notable career in economic. Collier provides a general theory, not really itemized, that is based on ethics, law, community, and the family. To him, it is a workable theory, and the major flaw is not in the theory, but in the implementation of it: how do we demand and enforce those on the extremes of the right and the left to join forces in a unified effort to ensure that commonly accepted community goals, a theory of the common good, are agreed to. It seems obvious to me as someone who generally accepts Collier's plan that the vested interests on the fringes of ideology--the capitalist billionaires who control how much they pay in taxes on the right and the vested interests of the rent-seekers of both the left and the right--stand to lose status and will fight to preserve those statuses even in the face of a shared belief that is time to return to a 'common good' for families, communities, the state and the nation.
" Families, firms, and states are the essential areas in which our lives are shaped. . . .
" The peole at the top of organizations in families, [business and private] firms and states are more powerful than those beneath them, bugt usually they have responsibilities that far exceed their powers. To meet their responsibilities, they need other people in the group to comply, but have only limited means of enforcement. In my role as a father, I try to insist that Alex goes to sleep at night. But raw power is hard work and not very effective: Alex reads under his bedclothes. In all successful organizations, whether families, firms, or states, leaders discover that they can radically increase compliance by creating a sense of obligation. . . . [i]f I can persuade him to go to sleep, the challenge of enforcement is reduced [and] my power is tsansformed into authority. More grandly expressed, this is the construction of moral norms for strategic purposes. The crucial power of leaders is not that of command: it is that they are positioned at the hub of a network. They have the power to persuade . . . to shape our lives. . . . It is a healthy process that has enabled modern societies to be [in] better places than all previous societies. . . .
Collier proceeds to identify what may be the single most important component to forging and implementing his theory. Reciprocity and ignoring of rent-seeking in defining duties and formulating benefits and costs. of black South African oppression, Springbok rugby. Great leaders persuade other first before they march. Collier identifies what may be the most important components to forging and implementing a lasting theory of capitalism. Reciprocity and ignoring of rent-seeking in defining duties and formulating benefits and costs. How do we get where Collier would like us to go? A sense of place, he says, gives us an immediate identity with the values and actions that made us who we all become. Collier's is Sheffied, of course. Even though I have lived in every region of the U.S. except the Deep South and the Southwest, I still identify with the values and childhood I lived in Gloucester, New Jersey, a small town of 14,000 (even today) across the Delaware River from Philadelphia. [This idea led me to think of how I still identify with the Phillies, or how those from Boston identify with the Red Sox--maybe hometown sports teams have a place in this, as in 'I'm from Arsenal or Tottenham, or from the Mets). The parts of the book I found truly inspiring from the standpoint of economic interest was Collier's treatment of economic rents, taxation of rents and agglomeration of rents, and rent seeking. I will not dive deeply into these theories here, because they require focus to understand the complexities of the thinking behind it. What sealed my appreciation for Collier's integrity was this statement"
"the resources spent on rent-seeking are a total waste." Boom. There it is: eliminate (if possible) dramatically marginalize resources spent on attempting to create an economic advantage from something that does not expand value or expand the economic pie, e.g. lobbying for the creation of a monopoly so that shareholders not the society at large would benefit, either in the increased profit or from any value or efficiency created. This, I think, is worth an effort all its own, one that, if it succeeds, would improve life uniformly and universally. And, he has something to say about rent-seeking and tournament jousting by lawyers, only a third of whom he says are actually seeking or doing justice. And Collier does not avoid issues of taxation, rule by meritocracy and the meritocrats, and corporate governance and social responsibility (how socially conscious is it when Starbucks, through a subsidiary based in the Dutch Antilles which sells Starbucks' licenses to the British Starbucks's store, completely avoids the payment of taxes on British generated profits to the extent of the costs of the licensing arrangements. Rent-seeking? Yes, maybe even a corrupt purpose that diminishes any claim Starbucks and companies doing the same thing to involvment in a social purpose that promotes a common good. I found one flaw, not in Collier's reasoning, but an analogy he uses to explain where things sadly went wrong with capitalism. He argues that the rich areas, among them Catalonia in Spain, often seek isolation from the rest of the nation in which they are formed politically through secession. In the U.S. during times of economic dysfunction, the Texas secessionist movement works up crowds by exhorting people to separate from the U.S. [Of course, none of the disadvantages of secession such as how do we pay for the investment made by the US national government from US (not just Texas) taxpayers get repaid are ever raised let along discussed. My problem is using Catalonia or any other region with a majority culture significantly different from the culture of the nation-state as an example. Catalonia fought the Nazis and Franco, a post war Nazi, when others in Spain and the world complained of it. The example is bad as would be the example of Quebec seeking to secede from English-speaking Canada or Northern Ireland being separate from the Irish Republic. Both are examples of culture and language overriding the nation in which these provinces are politically attached. Of course, it is always better that negotiated solutions are forged and implemented, something miraculously done in the case of the troubles in Northern Ireland and in Quebec. Clear, concise, and packed with ideas. The Future of Capitalism tells you very little about that subject. If one were cynical they might call the book Herbert Crowley redux; Crowley was the New Republic editor and FDR apologist who argued in an essay that “government is different” - where he propounded the odd notion that when government does something self interest flies away. There is a lot in this book - unfortunately a good deal of it suffers from two maladies - it misquotes many key figures or ideas and at the same time it comes The Future of Capitalism tells you very little about that subject. If one were cynical they might call the book Herbert Crowley redux; Crowley was the New Republic editor and FDR apologist who argued in an essay that “government is different” - where he propounded the odd notion that when government does something self interest flies away. There is a lot in this book - unfortunately a good deal of it suffers from two maladies - it misquotes many key figures or ideas and at the same time it comes to some odd conclusions. If this is what Oxford Dons do the University has fallen. The book’s basic thesis is that government can solve anything and that those evil libertarians and populists destroyed the idyllic time we had from 1945-1970. He never does explain why he picked those dates. My first objection to the book was his horrid characterization of Adam Smith - I suspect most of his interpretations of Smith came from a Golden Books version of the Wealth of Nations and the Theory of Moral Sentiments. Most economists argue that the two books of Smith - which went through multiple printings/revisions in seriatim must be read in concert. While each is worth reading on its own - the pair makes the arguments stronger. Collier asserts that Economic Man is supposed to be lazy and selfish. Has he not heard of the “bull headed brewer”? Has he not thought about Smith’s extended argument in both books about social behavior? If one reads TMS and even the WON one finds numerous references which contradict the notion often offered in the 1980s that “greed is good” to be entirely outside of Smith’s writings. Collier also asserts that the “ethical pragmatists” (Read FDR in the US) saved us from the prior uncertainties in the economy. At the same time he admits that WWII actually pulled us out of the depression not the programs of the New Deal. Many credible economists make the case that the New Deal and all of FDRs zig zags may have actually slowed down the exit from the depression. It is absurd to argue that WWII pulled us out of the depression. We did have consistent growth during WWII but the it was artificial - a major portion of the GDP was channeled into government spending. When the GIs came back from the war GDP surged (and many supporters of FDR argued that inflation would be rampant - which it was not) from all that pent up demand. He seems to ignore the negative effects of various tax schemes. While he admits that too much taxation can have some negative consequences he oddly believes that someone actually paid the 90+% rates in the fifties. I guess he did not have the chance to consider the interaction between rates and base. Finally he decries that most people don’t trust the words of experts - the talking heads. Is there any wonder why that happened? Had he read a bit more Buchanan (James, Nobel winner in 1986 for the development of Public Choice theory) he might have a better idea. But he seems to be blithely ignorant of those ideas. In the latter part of the book he proposes a set of theories which in some ways are intriguing. I will highlight two which I found interesting. The first is an extended discussion of why the elites (who are well educated and mobile) and the others (who are neither educated nor mobile) have diverged. I think a good deal of his commentary is accurate although when I look at his solutions they can mostly be reduced to more taxes and the development of something he calls “social maternalism” - which is his solution to eliminate the paternalism of the current state. A lot of the discussion is just plain silly. Some of it is worthwhile - but getting to those ideas is tough. One of his solutions is to suggest a Henry George like solution for reducing the disparities in wealth that have evolved in the last couple of decades. If you did, as I did, doctoral work in tax theory it was almost obligatory to read Henry George’s Progress and Poverty which proposed adjusting the tax system to capture the excess rents caused by land fluctuations. (I found when I read in this area that many supporters of George - including one candidate for Governor in California spent a lot of time debating debating obscure points - but that is less important to the point here.). Collier argues that one way to capture the excess rents now paid to well educated elites is to establish a tax based on educational level and location. Thus, a lawyer in San Francisco would pay a lot higher rate of tax than a lawyer practicing in a small city in Central Iowa. Same formula for bankers of all types and other kinds of entrepreneurs. Somehow the taxes collected, above and beyond what the normal tax rates would produce could be used to offer the less well educated some kind of compensation/training/adjustment assistance. Collier also describes the divergence between rights and obligations - both the left and the right have accentuated rights at the expense of the corresponding role of obligations. Both sides have allowed, through a series of ideas, to reduce the reciprocity of social interactions. Not exactly a new idea but one that is important to understanding the diminution of our political capital. Collier does not get that the "expertise" offered by the elites in the mythical period (1945-1970) have become increasingly less useful. Experts offer commentary beyond their expertise and they arrogantly claim that their ideas are settled issues. Capitalism has provided a good part of the world prosperity. When coupled with property rights (which he does not mention) and social obligations (which he does mention) nations can expect to be successful. The elites have argued that policies which support their goals (globalization, unfettered immigration, and a diminished respect for nationality) are policies which have not served the interests of a substantial portion of the population. If you want a historical snapshot of the old order - a nostalgic picture of what some think was an ideal time - then this is a good book. If you want to understand why a large portion of the elites and young people are attracted to discredited systems like socialism this book won't offer much. This is Paul Collier’s best book to date. It follows his other very good ones, notably The Bottom Billion, a watershed analysis of poverty published in 2007 that has influenced development aid approaches to the world’s lowest-income, most fragile states, not just at the World Bank, where Collier was once research director, but across Western donor agencies. The Future of Capitalism is mostly about rich countries, though, and how they have lost their way. It is a book about bad ideas that, unchallenged and unchecked, have taken root and come to be accepted as the driving truths of successful economies and societies. The bad ideas include liberal leftish ones, from old-vintages such as J.S. Mill’s utilitarianism, to newer ones such as John Rawls’s theory of justice. They also include the persistent misinterpretation by many conservatives of Adam Smith’s ideas as justifying the celebration of Milton Friedman’s call for unbridled profit-seeking to fatten shareholders’ portfolios, combined with the complacent, however misplaced, confidence that the resulting rising tide will lift all boats. It doesn’t, Collier reminds us, and because it hasn’t, we’re in one hell of a pickle. The gaps between rich and poor, educated and uneducated, metropolis and region have all widened. As a result, the sense of belonging, purpose and shared values that once sustained families, communities, firms and nation-states while also driving international cooperation, has been replaced by “new anxieties” whose intensity has opened ruinous divisions. These anxieties have also given rise to snake-oil-selling populists of right and left who have sprouted like mushrooms after the rain, and whose rule is making a bad situation worse, and more dangerous. The Future of Capitalism is an important piece of work by a learned economist able to draw on other disciplines, a vast range of eclectic reading, and easy access to the world’s smartest social scientists. His mind unclouded by ideological idées fixes, and his limpid expression makes it easy to read, absorb and be persuaded by the ambitious agenda he proposes to get us out of the mess we’re in. To summarize, his message is that we must, collectively, restore ethics to our approaches to managing the state, firm, family and world, thereby rebuilding inclusive societies and inclusive politics. He proposes a long list of policy fixes, large and small, some of which are new (e.g. “social maternalism”), and some repackaged old. For example, he retrieves and refits late-19th-century economist Henry George’s tax on land to recover for social purposes the billions of dollars that have—ridiculously, wastefully and destructively—overcompensated the innovative titans of ICTs and social media. Collier concludes on a hopeful note, though. “We can do better: we once did so, and we can do it again,” he writes in the book’s last sentence. I wish I were as persuaded on this last point as I was by his policy analysis and prescriptions. I approached the book with much interest having listened to an LSE podcast lecture delivered by Sir Paul Collier. The introduction to the book suggested it will tackle some important issues of the day such as the increasing economic divergence of major cities and the countryside. Indeed Sir Paul makes a number of interesting points, such as describing well the economic gains of agglomeration. However, his views on tax, and specifically his tendency to justify maximum tax extraction suggested a l I approached the book with much interest having listened to an LSE podcast lecture delivered by Sir Paul Collier. The introduction to the book suggested it will tackle some important issues of the day such as the increasing economic divergence of major cities and the countryside. Indeed Sir Paul makes a number of interesting points, such as describing well the economic gains of agglomeration. However, his views on tax, and specifically his tendency to justify maximum tax extraction suggested a lack of understanding of human nature. For example, he argues that a skilled worker in a major city should be taxed to the point where he is ambivalent of whether to stay there or go to the countryside. He states “we can tax the smart workers producing services in the metropolis without changing their behaviour as long as we leave them better off than working as farmers”. This is just another example of economists and politicians seeing the educated minority as a cow to be milked, disregarding the concept of perceived fairness, which is a strong human motivator. Sir Paul goes on to state that a similarly skilled worker in the metropolis should be taxed higher than one in a smaller city. This of course already happens through tiered income tax but he wants to take it a step further, thereby denying people the opportunity to make more net income in the metropolis (net of tax and higher living costs). This goes against the fundamental human driver to seek a better life and saps ambition and enterprise. Reading the rest of the chapter, it is clear that Sir Paul sees those workers in big cities like London and New York as undeserving and arrogant, which is something I cannot agree with. The book offers interesting thoughts on the topic of regeneration through business clustering but it seems to miss the key point that without good skills and talented, motivated workers it is hard to create a new economic cluster. Such workers are drawn to the large cosmopolitan cities, which offer career opportunities, culture and diversity - not the provinces. Sir Paul advocates the creation of regional and development banks to finance regional enterprises and boost the creation of clusters. Anyone who has experience of dealing with small regional commercial banks would attest that they are staffed by less experienced, less skilled and less entrepreneurial people. Therefore, although it may sound good in theory, in practice this is unlikely to provide a solution. Sir Paul offers a number of other interesting policy proposals but doesn’t acknowledge the complexity of coordinating change between government departments and various other public institutions, their motivations and objectives etc. Therefore, I fear little of Sir Paul’s proposals will be implemented any time soon. One thing is made very clear in the book - Sir Paul doesn’t like London and Londoners. The piece on immigration in the final parts of the book left me deeply disappointed. The author is arguing that immigration benefits only the immigrants and not the home society or the new host society. As such Paul Collier sees immigration as a net negative. There is much evidence that host nations benefit from immigration in many ways and I won’t repeat those arguments here. However, there is a wider ethical point that those born in a well organised society like the author chose to ignore. Why should someone born in a developed country have a bigger right to opportunity and quality of life than someone born in a developing one? Is the lottery of birth a sufficient justification for that? The authors thinking on this is at odds with his approach to discussing the other issues of globalisation. Convincing, even where my views differ. He calls this the politics of the "Hard Center" and is strongly anti-idealogue and pragmatic. He emphasizes ethical states, ethical firms and ethical families as the center for regaining social trust and individual investment. He points out that the 'economic individual' as historically utilized in politics and economics was a psychopath and most humans aren't. Historic capitalism has swept most needs under the rug of consumption. However increases in cons Convincing, even where my views differ. He calls this the politics of the "Hard Center" and is strongly anti-idealogue and pragmatic. He emphasizes ethical states, ethical firms and ethical families as the center for regaining social trust and individual investment. He points out that the 'economic individual' as historically utilized in politics and economics was a psychopath and most humans aren't. Historic capitalism has swept most needs under the rug of consumption. However increases in consumption won't provide meaning and may increase social divides, particularly those metropolitan versus not. He describes current trends and policies and how historic conditions were better and worse and claims of why and what we can do to restore them. His discussion of identity politics is something I'm going to be pondering for a while - he doesn't confine it to the familiar race and social justice categories but includes social identities of workers and CEOs and internationalist skilled and metropolitan workers. His argument for place based identity that is nationalist but not populist is strong and yes, pragmatic. The discussion of the power of agglomeration, the Henry George Theorem, and how it applies to both metropolitan geography and high skilled labor(tech workers) was textbook style political economics, and might be hard for some readers, but explains current trends better than anything else I've heard. His discussion of finance as a zero-sum brain drain that's not returning a social benefit in proportion to its percentage of the economy was more welcome to me as an American liberal. The argument for ethical firms, with worker representation on the board, and a move away from stock markets was also welcome and needed. He gave examples of Toyota and GM, BHS and ICI, and the profitability of companies that are privately versus publicly traded to support arguments that I would have bought on purely ethical and idealogical reasons. He extends those arguments into how training and the ethical firm and the ethical state are tied together in important ways describing the Swiss and German practices that lead to better vocational outcomes for both the firms and the society. His discussion of migration was also a little bit uncomfortable but I do think it's unfortunate when a Sudanese doctor makes more money by moving to London and driving a cab than staying at home. His family ethics and attempt to get retired people and more generations into the traditional role of extended families seems logical as well. His point about individualist policies placing duties in the state rather than the family, particularly in the context of child rearing and adoption/fostering is personal but important. There's some argument about human rights vs duties of rescue that I think were a little off, but they aren't a huge part of the book. He's anti-populist and supports reforms that would make populists and idealogues less powerful. The same reforms will also support establishment party leaders. He doesn't address climate change except that he addresses migration - and I do believe that any look at migration trends that attempts to address or modify patterns and doesn't look at climate change will fail in execution. His theories might be sound, but if there's no water the people will leave regardless of the rest of the economy. This is the age for a book like this. The economy no longer seems to be working. Society no longer seems to be working. Politics no longer seems to be working. This book looks at why this might be so. The first chapter provides an analysis of where it all seems to have gone wrong and I have to admit that I found it quite convincing. According to the author, we are living in a world that has been created, and distorted, by the Rawlsians and the Utilitarians. The result is a monstrosity. A Rawlsian This is the age for a book like this. The economy no longer seems to be working. Society no longer seems to be working. Politics no longer seems to be working. This book looks at why this might be so. The first chapter provides an analysis of where it all seems to have gone wrong and I have to admit that I found it quite convincing. According to the author, we are living in a world that has been created, and distorted, by the Rawlsians and the Utilitarians. The result is a monstrosity. A Rawlsian approach to the world is one in which individuals are given a basket of rights. These rights are given without corresponding obligations, which means that they are enforced against society as a whole, or the government in particular. According to the author, this has led to a society in which everyone feels a victim individually for a failure collectively. This is where identity politics originates. The Utilitarians, by way of contrast, look to find the greter good - often expressed in material terms - for the greatest number. It often finds expression in materialistic terms because it is a numbers based approach. The easiest number to measure is monetary value, which easily translates into greed and selfishness. Both of these trends are reflected in contemporary society. They have developed at the expense of a sense of community, and that is where the remedy needs to be found. The author talks about restoring ethics to public life. To government, to corporate life, and to the family. This is an argument against self-interest and found its most recent expression in the social democratic parties of the recent past. The aim of the auther would be to create a more inclusive society. This means bridging the geographic divide, the class divide, and the global divide. The geographic divide resonates quite well at the moment. In the UK, the expression is an antipathy between London and the rest of the country. This issue has started to raise its head, and has quite some way to go. It is at this point that the book wears thin. The author has a well disgnosed problem, he is quite good on what treatment is needed, but the medicine presceribed is pretty thin. This is where the book falls down. The author has nothing more than the suggestion of a reintroduction of national service and taxing the rich more heavily. I was disappointed at this part of the book. For example, how would he prevent tax jurisdiction shopping? How would he tax the disembodied company? How would he stop the wealthy form upping sticks and living elsewhere? When you hit the level of policy prescription, detail and granularity are exactly what is needed. In this book they are lacking. The book has much to recommend it. The analysis of where we are today is very convincing. The need to develop more of a communitarian approach is quite right in my view. I rather feel that the policy prescriptions belong to a world which he is trying to change rather than one I would choose to rush towards. They are too negative. I would have preferred a more positive approach by laying out a world in which I wanted to live. The author is almost there, but doesn't quite make it. Paul Collier takes a step back from his usual battleground of third-world countries and looks at how modern-day western countries have moved in a disconcerting direction, towards increased alienation, reduced social mobility and ever widening inequalities, on a geographical as well as social level. He looks at 'broken cities', and uses himself as an example. He grew up in Sheffield - the archetypal British broken city, where everything has gone pear-shaped since the steel works were exposed to c Paul Collier takes a step back from his usual battleground of third-world countries and looks at how modern-day western countries have moved in a disconcerting direction, towards increased alienation, reduced social mobility and ever widening inequalities, on a geographical as well as social level. He looks at 'broken cities', and uses himself as an example. He grew up in Sheffield - the archetypal British broken city, where everything has gone pear-shaped since the steel works were exposed to cheaper competition from abroad. He has a cousin of the same age with whom he was very close, but whereas he did well in school and ended up a professor in Oxford and with a knighthood, she dropped out of school and became a teenage mother. He blames this on the society as a whole not helping out - but also on the inclusive society in the 1950s giving him an opportunity to shine and advance on his own merits, something that would be much more difficult today. Today we see how assortative mating and regional inequalities have led to increasing gulfs between haves and have-nots. He also points out that some current policies have had unintended consequences, such as how the bonus-based benefits of CEOs have let to a focus on quarterly results instead of long-term growth, and how the otherwise laudable initiative Teach First has led to London getting even further ahead in education league tables. His recipes for solving the modern conundrums are mostly reasonable - redistributive taxes on efficient agglomerations to help struggling backwaters, help for struggling families and some limits to indiscriminate migration. 3.5. I read the Kindle version. Collier is British so most of his examples are from the UK. The book has several thoughtful points. He stated several times that he is not a Marxist and I thought he doth protest too much. His prescriptions nearly all involve direct intervention by the state, taxes and or transfer payments. So, I either disagreed or looked askance at most of his prescriptive elements. However, much of his analysis was thoughtful and occasionally quite insightful. He has a great de 3.5. I read the Kindle version. Collier is British so most of his examples are from the UK. The book has several thoughtful points. He stated several times that he is not a Marxist and I thought he doth protest too much. His prescriptions nearly all involve direct intervention by the state, taxes and or transfer payments. So, I either disagreed or looked askance at most of his prescriptive elements. However, much of his analysis was thoughtful and occasionally quite insightful. He has a great deal of overlap with Fukuyama's "Identity". One of his basic premises is that the historical success of liberal democracies has been dependent on reciprocal obligations. For example, medicare is a reciprocal obligation of one generation to the next. The payments of a generation today will reciprocated by the next generation in the future. This reciprocity is supported by the social understanding that all rights have matching obligations. However, since the 60's, the rise of utilitarianism and libertarianism has resulted in a social understanding of rights without matching obligations. These rights are determined by utilitarian calculations by bureaucrats. He recommends we move back to shared identities with shared communal obligations. An interesting premise although I don't what we can do to accomplish. He has some ideas but they seem naive to me. 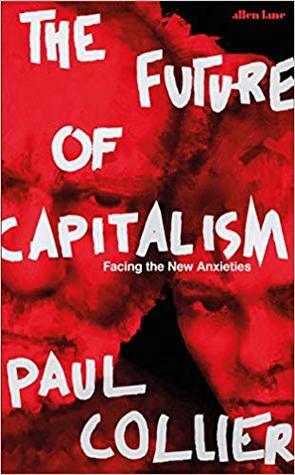 This book does a great job of explaining and examining the new anxieties brought about by modern day capitalist societies. How did we go from a largely united nation with common goals to one that is heavily divided along social, political, and economic lines? Collier raises interesting points about how both Left and Right extremes have lost sight of governing in favor of arguing ideology to no end. One of my favorite quotes of the book is, ..."the path of ideology will lead us to unresolvable so This book does a great job of explaining and examining the new anxieties brought about by modern day capitalist societies. How did we go from a largely united nation with common goals to one that is heavily divided along social, political, and economic lines? Collier raises interesting points about how both Left and Right extremes have lost sight of governing in favor of arguing ideology to no end. One of my favorite quotes of the book is, ..."the path of ideology will lead us to unresolvable social conflict. Ideologies are less likely to take us forward to their imagined utopias then back to lives that are nasty, brutish and short." The arguments in this book are nuanced and avoid some of the typical problems I have with self proclaimed "centrists" that don't offer any real insight or new creative solutions to problems. In particular I like how he addresses a return to ethical states and firms as well as the disparity between booming metropolises and broken provincial cities. My only real criticism is that he never addresses the huge problem of private money corrupting politics that I think would do a lot to ease the ideological divide and remove the power from vested interests and shift it to the average voter. The thesis of this work could be boiled down to this: "Capitalist societies are the most beneficial kind of societies, but they need to find common goals in order to benefit everyone." Collier argues convincingly for the idea that Western countries need to build healthy national and communal identities in order to make capitalism ethical again. Strong families and inclusive patriotism are key parts of this vision. He argues less convincingly for the idea that top earners should pay higher taxes The thesis of this work could be boiled down to this: "Capitalist societies are the most beneficial kind of societies, but they need to find common goals in order to benefit everyone." “We are social beings, neither economic man, nor altruistic saints. His “how” requires shared obligations to each other without losing the dynamism of capitalism! Good idea! Quite a goal. But “We are social beings, neither economic man, nor altruistic saints. Good idea! Quite a goal. But there is no practical or reasoned solution in his book! Note: my comment! The shared identity that existed in the 1950’s through the 1980’s (our glory years) was the result of the greatest generation together winning a war and recovering from depression! And we had a common enemy, the Soviets, that bound us together! Idealistic capitalism from Hayek, (1960) et al idealized individualism and heroic success. Hardly emphasizing shared identity. An economist that gets it, Collier deftly addresses what far too many in his profession have avoided through philosophical rigidity and self delusion: economic principles are not akin to the (mostly) immutable laws of hard science. This is not a call to kill capitalism; it is a plea to reconsider outdated paradigms and incentivize ethical behavior, not the least of which involves an all important emphasis on reciprocal obligation. Pragmatism, ethics, and communal norms have been stripped out of An economist that gets it, Collier deftly addresses what far too many in his profession have avoided through philosophical rigidity and self delusion: economic principles are not akin to the (mostly) immutable laws of hard science. This is not a call to kill capitalism; it is a plea to reconsider outdated paradigms and incentivize ethical behavior, not the least of which involves an all important emphasis on reciprocal obligation. Although this is not an entertaining book, it is a real standout in politics and economics for this age. Most books these days state their theories, come up with stories to support their theories and then conclude that their theories are, in fact, reality. Paul Collier took the right approach, to review various social, economic and political issues going on in the last 50 years, evaluated the pros and cons and then came out with the problems currently being experienced now. He then outlines a nu Although this is not an entertaining book, it is a real standout in politics and economics for this age. Most books these days state their theories, come up with stories to support their theories and then conclude that their theories are, in fact, reality. Paul Collier took the right approach, to review various social, economic and political issues going on in the last 50 years, evaluated the pros and cons and then came out with the problems currently being experienced now. He then outlines a number of socio-economic ideas and political changes which might fix global problems. Although some of his ideas are radical, he does really espouse that we have lost control, in every country across the globe, the center and let the extremists take over political policies and socio-economic responses to these problems. My impression is that Paul Collier is trying to do with the left-right debate what he did with the Sachs-Easterly debates on aid for developing nations: be the respected voice in the middle that can be relied upon to evaluate the evidence rather than interpreting everything through the lens of a strong ideology. I thought he did a good job (not a great job, but a pretty good job) of doing that for aid to developing nations in The Bottom Billion. In this book he really struggles. In the beginning My impression is that Paul Collier is trying to do with the left-right debate what he did with the Sachs-Easterly debates on aid for developing nations: be the respected voice in the middle that can be relied upon to evaluate the evidence rather than interpreting everything through the lens of a strong ideology. I thought he did a good job (not a great job, but a pretty good job) of doing that for aid to developing nations in The Bottom Billion. In this book he really struggles. In the beginning of the book he makes sure to say scathing things about what idiots people on the right and the left both are. He has some legitimate but not in any way original criticisms of both camps, but in general he grossly simplifies their positions and then proceeds to condescendingly knock down the straw men he just erected. Paul Collier, CBE is a Professor of Economics, Director for the Centre for the Study of African Economies at the University of Oxford and Fellow of St Antony's College. He is the author of The Plundered Planet; Wars, Guns, and Votes; and The Bottom Billion, winner of Estoril Distinguished Book Prize, the Arthur Ross Book Award, and the Lionel Gelber Prize.